Anticipation, like a gas, is permeating my home today. It has been flowing through our every thought, action, and procrastination. You see, school starts tomorrow. Faye will be going full time, as a wise and grown up first grader. She hasn't stopped talking about it since we went to Back to School night, where she was obviously bestowed with the gift of "All Knowledge" and "The Gab." 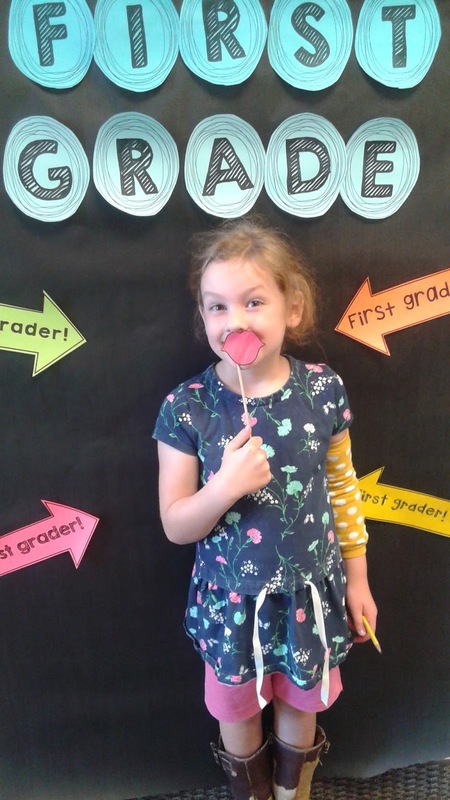 If you have any questions about what first grade is going to be like, just ask her and she will fill you in, with excruciating detail, on how everything is going to go down, according to her mind. Keith, on the other hand, has had quite the opposite reaction. Whenever school is mentioned he becomes a dust cloud, a sonic boom, the invisible man. School has no right to come this early and interrupt his glorious summer vacation of trying to play video games while his mom (me, aka "The Evil One Who Only Wants Me Around To Do More Chores And Clean Your Whole House, And I Already Did My Chores When You Weren't Looking, And The Reason They Don't Look Clean Is Because Someone Must Have Come And Messed It Up Right After I Cleaned It, And That Sock Has Not Been There All Week, Someone Just Put It There!") 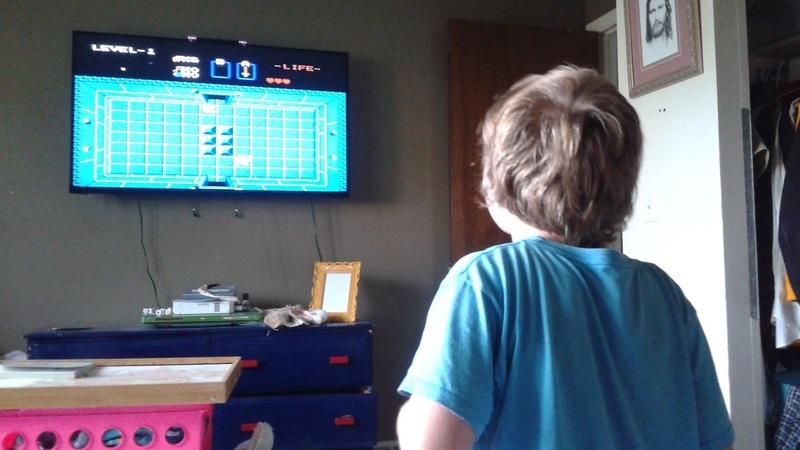 desperately tries to get him to do something so he doesn't end up like poor Jimmy Jet and His TV Set (Shel Silverstein, in case you were wondering). Beth is dreading losing her playmates, and the convenience of blaming every. single. thing. on Faye. Meanwhile, she is also crazy excited to have so much time with just me, her and Vince. She loves Vince like Golum loves his Precious. She may have attempted to eat him on occasion, because she claims she cannot resist his cuteness. While I agree his cuteness is nearly overwhelming, I have had to explain to her that if she were to eat him, we would no longer have a cute little baby to snuggle, just some severe indigestion. Finally, there is me (just me this time, no elaborate aka). 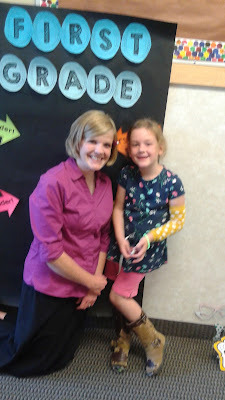 I am excited for them to go back to school as there will be the added structure that school always brings. I do so much better on a schedule, and am excited that I will again have that structure. on the other hand, I will be missing my kids like crazy. I have become accustomed to having them around, and I quite like them. But I am excited for all of the new experiences they are going to have, and the friends they are going to make. I loved school when I was a kid, and I am hoping that Faye's excitements stays forever, and that Keith can catch some of the joy of school, like a virus. Suddenly and violently. This whole week has been focused on getting ready for the new year. Last year I finished getting them the uniforms that they needed. It should be illegal to grow the way that those two do. Keith had to get an entire new wardrobe, including undies, socks, shoes, pants, shirts. Seriously, everything new because he grew so much and nothing fits him now! We were lucky with Faye because we have wonderful neighbors who share clothes with us. We were given so many new uniforms that fit my girl perfectly, including shoes! All I had to get for her were socks and an occasional par of pants. All that was last week, though. Sunday night I began to straighten up the living room before going to bed, and somehow got sucked into the Black Hole (aka Faye and Beth's bedroom. Aptly named because things gravitate towards their room, and become forever stuck or lost once you pass the Event Horizon, or their door.) I ended up cleaning their whole room while they slept, and it was quite a project! The door could neither open nor close any more than this because of the gravitational pull of stuff. I didn't realize how long I had been in there, but I began cleaning around 9:30, and finished around 3. And then as I was going to bed, Vince, of course, woke up and wanted to eat. And he didn't finish and go back to bed until 4. To say I was tired Monday morning would be an understatement equivalent to saying Frodo and Sam went for a leisurely stroll to toss a ring into a little puddle of steam. And yet, I had plans for Monday! Monday Annie, Adrienne, and I all loaded up our kids, squishing as many into each vehicle so we wouldn't all have to drive, and headed to a cheese factory to get some squeaky cheese, and shelf stable milk. I needed the milk so that I could have it to put into the kids' lunches this year. And then they went to another food outlet store to get some cheap filler snacks for their lunch boxes. And then we had to stop to get ice cream, of course. Finally, we ended our excursion at an Amish store. Because that is a perfectly normal outing, right? By the time we got to the Amish store, I was exhausted, and I was so ready for school to start. Spending all day long, in close quarters with 10 kids while functioning on only 3 hours of sleep is not ideal. But I have to tell you, if I could marry that Amish store, just for its deli, I WOULD! Annie, Adrienne and I stood at the back and chatted with the guy who sliced the meat and cheese for us. For a good half hour, we stood there, sampling cheeses and meats that he told us about. And can I tell you about the chipotle cheese? It was the smoothest, creamiest, yummiest thing that has ever caressed my pallet. I will be going back soon, just for the cheese. The pumpkin butter was quite divine, too, but really, nothing holds a flame to that cheese! And I didn't even know I was a cheese lover like that before we got there. 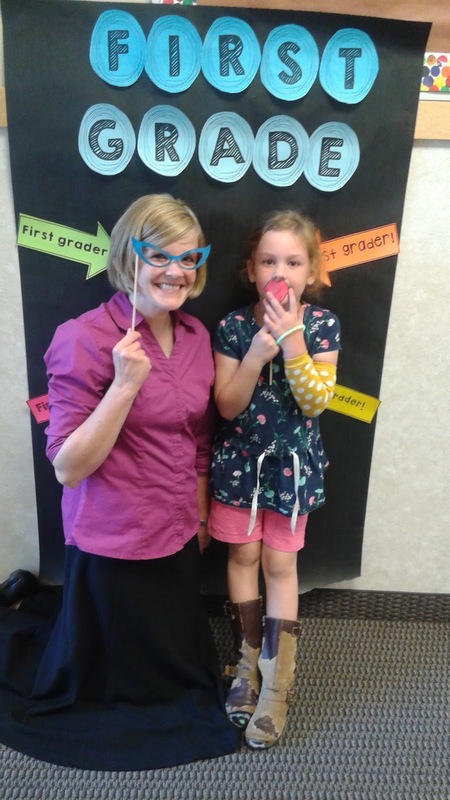 Tuesday was Back to School Night. I strapped Vince onto me, and then we headed out to meet the teachers. Keith was much alleviated once he talked with his teacher. He has the same wonderful woman he had last year. He had his heart set on getting a new teacher, but he is excited now. Faye, of course, bounded in to meet her teacher with a burst of energy rivaling that of the birth of a new star. She flew around the room, lighting up everything in her vicinity as she explored her new home for the school year. She met some old friends, and was in and out with kaleidoscopic energy and enthusiasm. Keith was as steady and serious as ever. 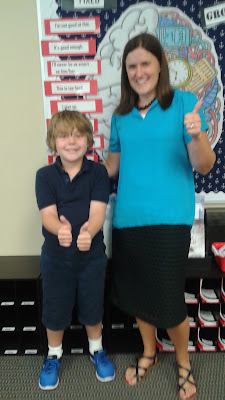 His teacher wonderfully put him at ease, and even helped him be excited for the year to come. I just love her and am so glad he has her again! When we finished with Back to School night, we went to the local Soda Parlor and got a treat. 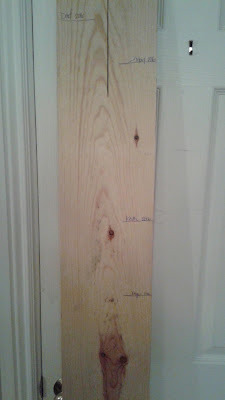 Then to the hardware store for a growing chart board, and home. Which brings us to today. We got our backpacks out and began filling out the paperwork that needs to be returned tomorrow. I added the events that will be happening these next few weeks to my planner, and Faye started on her homework. She is so excited to be going back to school! Keith made his lunch around 3:00 and put it in the fridge. His school clothes have been spread out on the ottoman for just as long. He is so careful and meticulous with everything. Faye, on the other hand has barely been able to keep herself from exploding with the excitement of going back to school tomorrow. She practically flew around the house, leaving chaos in her wake. 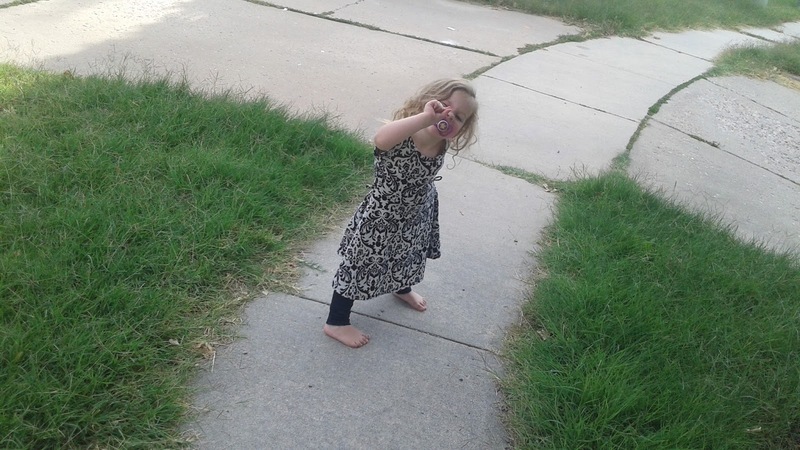 She went to the neighbor's house and played for a bit, and then came home and caused chaos once again. She still doesn't have her stuff ready for tomorrow, because she is having serious difficulty in staying still long enough. 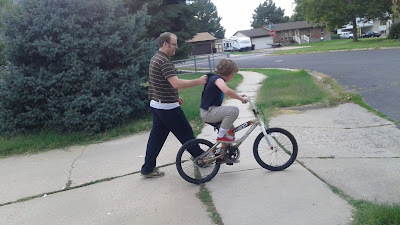 I have been trying to coax Keith into learning to ride his bike for a few years now. Today was the day he finally decided to give it a try. I took Vince out in his bouncer and set him in the shade on the grass. 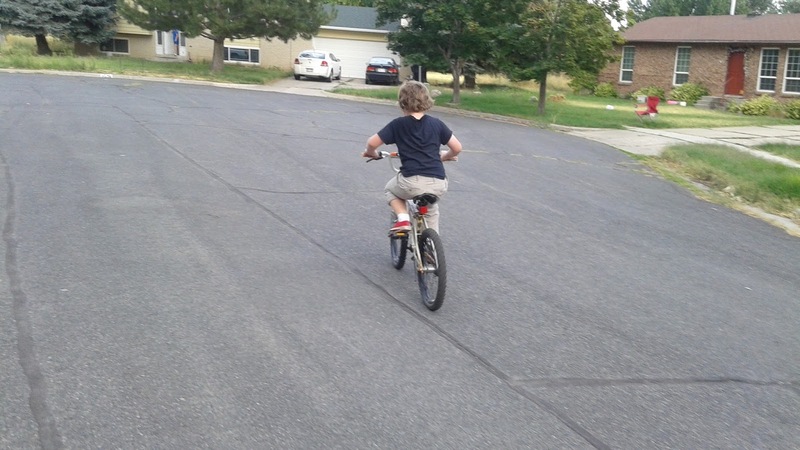 I then pulled out the bike. Faye, being the more adventurous of the two hopped right on the bike, now fear at all. 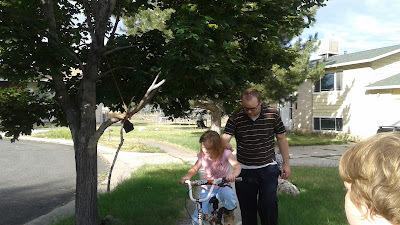 She began pedaling, and with a little bit of coaching, she began to pick it up! But then it was Keith's turn. It is his bike, after all. Her bike has two flats, so we just focused on using Keith's. Oh my goodness, I love that boy's determination! 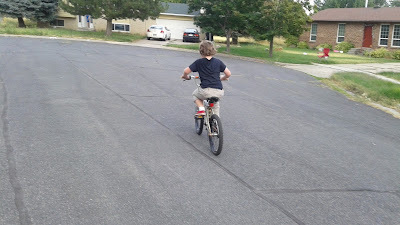 With a little coaxing, he was nearly riding on his own! And then Jeffrey came out and took over, which lovely for me, because I could then pull out the camera and go all paparazzi on them. Jeffrey is so practical. His first instruction was to teach them how to fall. "Lean into the fall," he taught them. 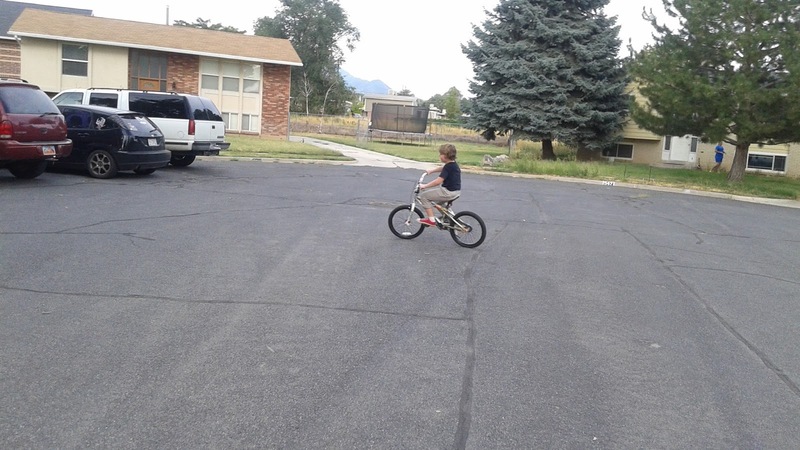 And then he tried to help them learn to ride. After about twenty minutes, Keith asked if I could come back and help them, because I am the better teacher. I laughed! I didn't teach so much as encourage, tell him he could do it, and help him balance a little bit. And now my children understand the exhilaration of freedom. The freedom that flying through the air, the wind tugging at your clothes and hair, and the absolute joy of speed that signifies bike riding. They are already planning biking trips, and I am thrilled that they are so excited, because so am I. I haven't gone biking at all since... who knows how long? But I have longed to. 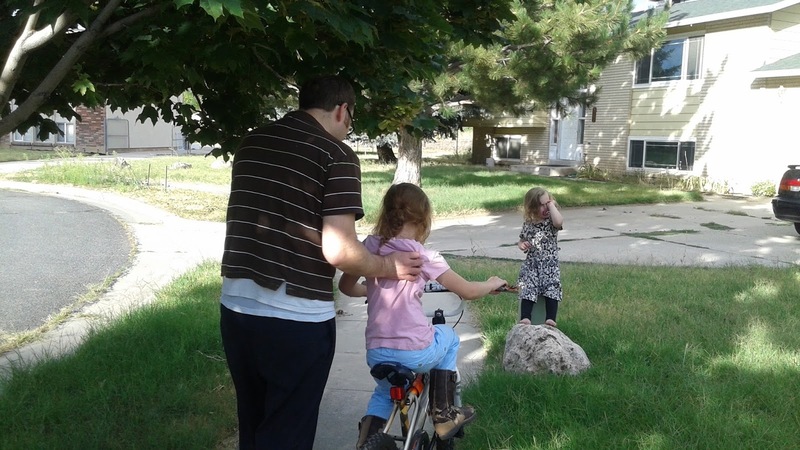 Before the kids started to learn, they had to beg me to get off of the bike so they could have a turn. And while it was a very small bike, and incredibly difficult for me to steer, I got a taste of that excitement again! What an apt way to end summer, on the wind of a bike. And then it was time for dinner, showers, prayer, and bed. 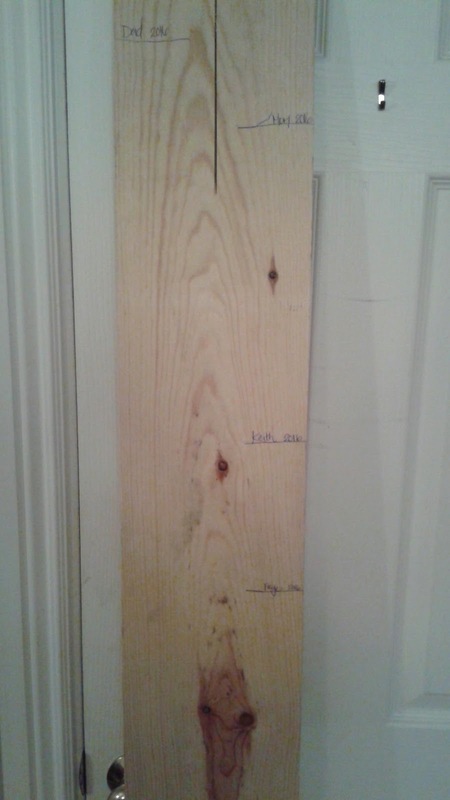 Before bed, we pulled out the Growth Chart board and I measured everyone. Jeffrey may have cheated a little, because there is no way he is that much taller than me, but he laughed and said it is now etched into wood for history, so no one will ever know the truth. Typical. I also presented the kids with key chains with charms for their backpacks. The smiley face is to remind them to be kind and to help others. We do all we can to make others happy. If we see someone who is sad, we help them. If someone is being teased, we be their friend. We make others laugh. We care about them. When we do this, it will help us to be happy, as well. 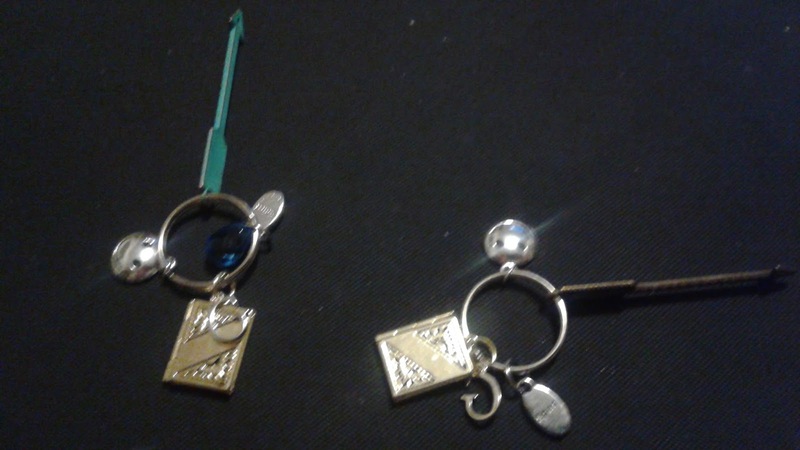 The book charm is to remind them that the main reason they are in school is to learn and progress academically. They are to focus and take advantage of the free education that is being offered. They need to be tough and brave. There will be lots of hard things that they will have to do at school. Many will be scary. They need to remember to follow the example of the Stripling Warriors (the arrow charm). The Warriors were brave because they prayed to God for help, and if Keith and Faye do the same, they can have courage! When they pray, their answers will come to them through the Holy Ghost (Spirit charm). They will have to stand up for the right. Not everyone will have the same rules as our family (the G charm), and that is okay. They can still be a friend to people who have different rules, but if they do things that make them feel bad inside, then they can choose to not do those things with them. They can walk away. They should do things with friends that help them feel good inside, things that will help them feel the Holy Ghost. Finally, they must cherish the Word of God. (hold to the rod charm- which I hadn't put on when I took the picture). Throughout everything, they will gain strength, courage, knowledge, and guidance by studying the scriptures and abiding by the things that they learn. If they stay close to the word of God, all things will work out, always. And I gave them sanitizer because germs. I hope that seeing the key chain with the charms will help remind them to make the right choices. I hope that they are going to have the best year ever! And now, instead of going to bed so I can get up early and be a happy mommy, I am dangerously close to deciding to cleaning, because then they can wake up to the peace of a clean house with a lovely pot of crockpot oatmeal ready to eat for their first day of school! 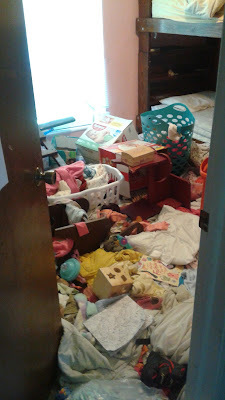 Hopefully it wont take as long as Faye's room did! What a week! And I seriously adore your writing skills! !